The Supers: 3rd Best Super Hero Team in the World! THE SUPERS #2 CROWDFUNDING CAMPAIGN IS NOW LIVE!!! UPDATE: Just before I was able to do a guest lecture at the local Kelowna Library, Global Okanagan/CHBC News came and interviewed me…and here is the end result! UPDATE: Things are happening fast around here…I’ve uploaded The Supers anthology to ComixCentral, a leading online Comic store. I’ve split up the stories into parts, so you can check out various stories, like “Side Projects” 5 pages of fun, for FREE right now! Check them out and leave us a review! UPDATE: Here is a work-in-progress Marvel Studios-style video for “The Supers: 3rd Best Super-team in the World”! Enjoy! UPDATE: On January 24th, I will be a guest speaker at the Public Library in Kelowna, BC at 6:30pm, with the topic “How NOT to make your Comic Book!” I’ve learned a lot in the past seven years, trying to self-publish my comic book, and I will be sharing that knowledge…I hope you can come check it out! UPDATE: Happy Holidays and a Happy 2019 to all! UPDATE: Here is The Supers #2, Page 8, a sneak preview of what’s to come! As always, art by Ricky Gunawan! UPDATE: AMAZING REVIEW by Sirens of Sequentials!!!! Thanks so much, have a read yourself here! 4 out of 5 stars! UPDATE: Chelsea Crutchley is doing some amazing work for a back up story called “The Flight Home” coming up in The Supers #2! UPDATE: Had a great time at the Edmonton Fan Expo 2018! Had a great panel moderating “The Big Two Who?” with Daniel Schneider, Alexander Finbow, Chase Kantor, Jeff Martin and John Delaney. Hope to have it posted as a podcast soon! UPDATE: The Supers is now an 80-page GIANT! New content just added! UPDATE: I hope everyone is enjoying their summer, before it's back to school! Here's a picture of The Supers enjoying their summer and their brand new tattoos! UPDATE: Here is a sneak peek at The Supers #2, Page 6! Art by Ricky Gunawan! UPDATE: Here is a look at The Supers #2, Page 5! Art by Ricky Gunawan! UPDATE 6/9/18 Here is a preview of The Supers #2, page 4! As always, the amazing art is by Ricky Gunawan! UPDATE 6/2/18 Glad to announce that The Supers #1 is on the shelves for sale at Happy Harbour Comics in Edmonton, AB. This is my favourite place to buy comics, so if in the area check it out! UPDATE 6/1/18 HAPPY PRIDE MONTH 2018! UPDATE 5/29/18 Congratulations to our contributor, JEFF MARTIN, on his nomination for the 2018 JOE SHUSTER AWARDS! 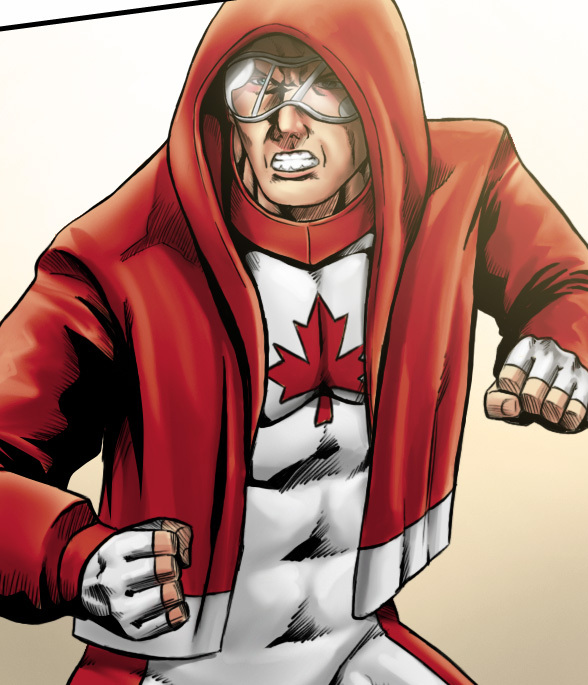 According to their site "the JOE SHUSTER AWARD is Canada’s national award that honours and raises the awareness of Canadians that create, self-publish and sell comic books, digital comics and graphic novels" Jeff has been nominated in the category of "Single Creator/Creative Team" for "Where is Zorg? ; Wrestlemon" and we wish him well at the ceremonies in Montreal in July! Jeff has contributed ALOT for this project, alot of which you haven't seen yet, but scroll up and read "The Supers Epilogue: Side Projects", written by me and drawn by Jeff, for a sample of his work. Also check out Jeff's Patreon page and his new webcomic Hell, Inc - which is tremendous! Check out all the AMAZING Canadian talent nominated HERE it's inspiring to see! UPDATE 5/28/18 On this, my 41st birthday (yeesh! ), it's great to announce that The Supers #1 is on the shelves at The Book Shop in Penticton, BC, my hometown. This is especially cool in that this is where I used to go after school everyday and buy comics, so the fact MY comic is there is quite special! Thanks to Roz and everyone at the Book Shop for making this happen! And if you are in the Okanagan Valley in southern BC and like reading, you have to check this place out! It's like a shrine for book lovers! 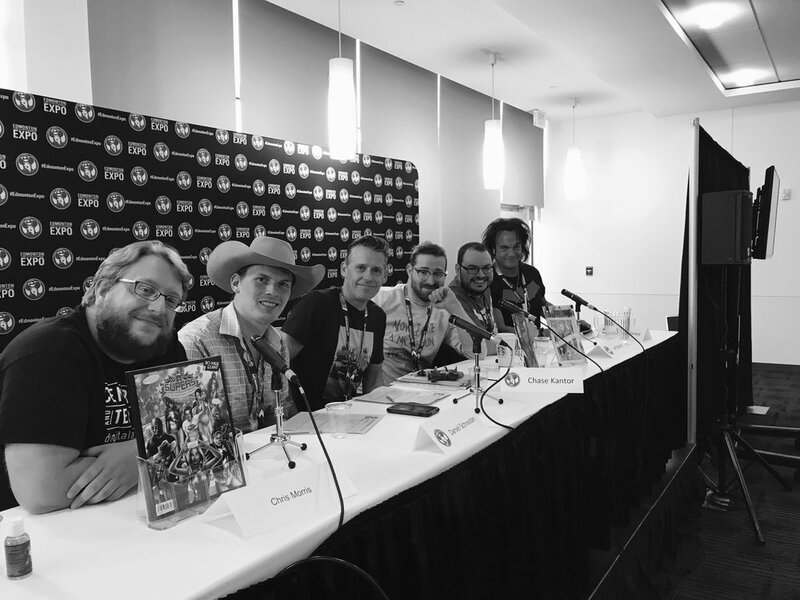 UPDATE 5/26/18 Had a great time at Panel One in Calgary! Great to see so much talented artists! UPDATE 5/3/18 BIG NEWS! "The Supers: 3rd Best Super-Team in the World" #1 is currently on the shelves! 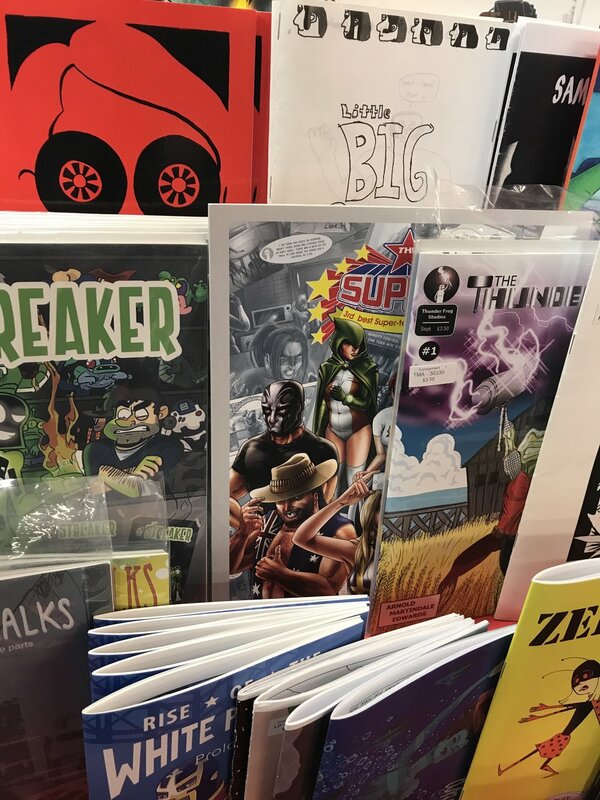 So far "Another Dimension", and "Red Skull Comics" in Calgary, AB have The Supers in their "Local Artists" section, as well as "Happy Harbour Comics" in Edmonton! Pictures to come! More cities/shops to be added soon! Another Dimension Comics in Calgary, AB! Local Artists section! UPDATE 5/2/18 Wow I'm bad at updating! The more cool stuff is taking place, the less I update the site...isn't it ironic? This is old now (currently working on page 5! ), but here is page #3 for The Supers #2! UPDATE 3/26/18 Here is the new page #2 for The Supers #2 by the superbly-talented Ricky Gunawan! Enjoy, and there will be more updates to come! UPDATE 2/8/18 Here it is, the first sketch for the upcoming #2 issue of The Supers: 3rd Best Super-Team in the World! UPDATE 1/20/18 Newest character in "The Supers" universe...Credence! Art by Ricky Gunawan! UPDATE 1/7/18 I'm a few days into my January Movie-A-Day Blog, check it out here. Also here are links to the December blog, July blog and August blog! Enjoy! UPDATE 1/1/18 HAPPY NEW YEAR! And a Great 2018! UPDATE 12/26/17 HAPPY BOXING DAY! AND HAPPY KWANZAA! UPDATE 12/25/17 MERRY CHRISTMAS! AND HAPPY 78th BIRTHDAY TO MY DAD! UPDATE 12/2/17 I am doing another Movie-A-Day Blog for December 2017! Also, check out previous Blogs for JULY and AUGUST! UPDATE 11/24/17 Check out the latest character designs for The Supers: Euro characters The Sabraman and Schnell by Ricky Gunawan! UPDATE 11/21/17 Apologies for the lack of updates recently...a variety of issues have come up lately, between work (my regular 9-5 job, not this one...) being crazy, family health issues and printing problems, The Supers have been very low-key lately, including not being able to attend the Vancouver Fan Expo as planned. Despite the low key exterior, behind the scenes The Supers creative team is busy as ever, fixing the printer issues for #1 and #2 is also well under way, with scripts written, new character designs underway and plans for a bigger and better 2018! 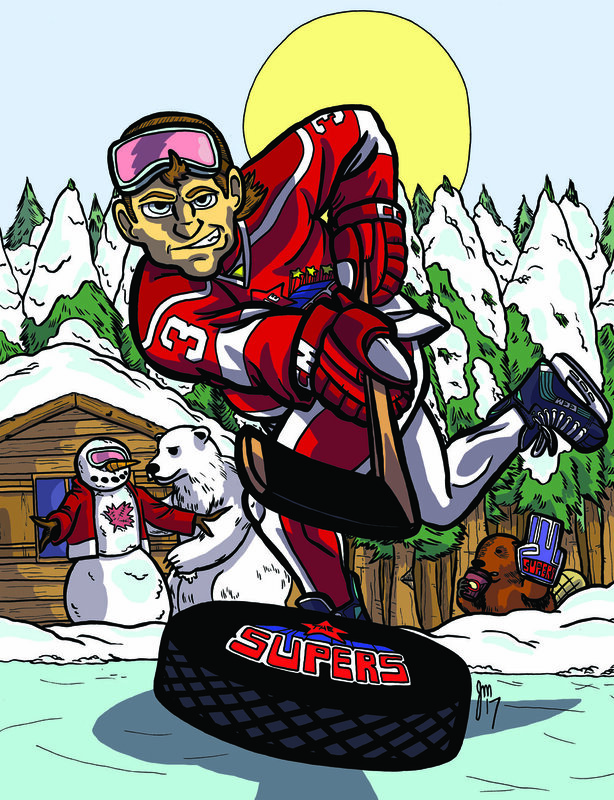 The Supers 1st run is nearly sold out so if you want a copy, please let us know before these issues are all gone! Thanks! UPDATE 11/1/17 Have you been noticing how awesome CHAPTERHOUSE COMICS are? Went to a few Chapterhouse panels at the C4 Comic Con and I'm excited about what's coming soon from them! UPDATE 10/30/17 Had a great time at the C4 Comic Con in Winnipeg! Now onto the Vancouver Fan Expo November 10th-12th at the Vancouver Convention Centre! Saskatoon Expo "The Supers" Panel with (L-R) Jeff Martin, Elaine Will and Chris Morris (moderator). Listen to the panel by clicking the link above! UPDATE 10/17/17 I recently did an interview regarding The Supers...sure it was on my own podcast...but I think it turned out well! If you want to know more about the the how-and-why regarding The Supers, take a listen! Enjoy! UPDATE 10/16/17 Sales are going great, hopefully some reviews are coming soon! Winnipeg's C4 Central Canada Comic Con is next! October 27th to 29th! UPDATE 10/4/17 1st ever sale of THE SUPERS has happened! With many more to come! 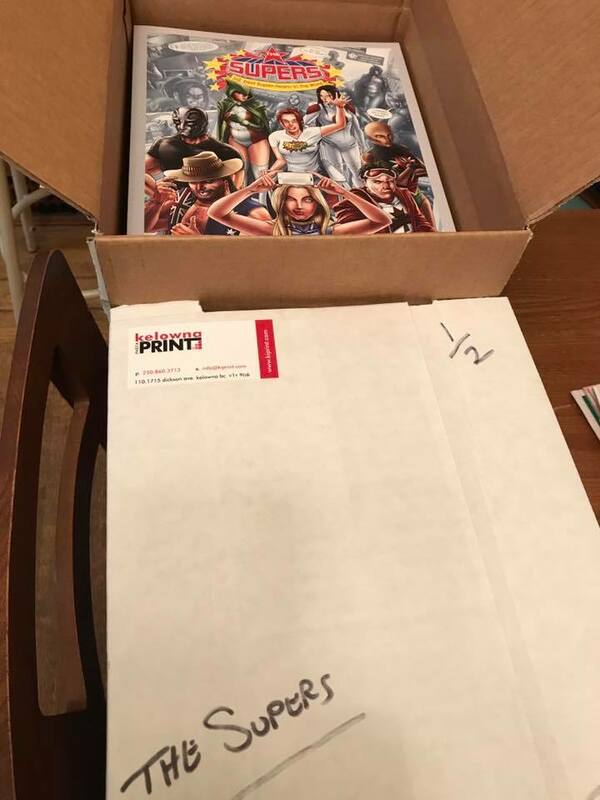 UPDATE 10/3/17 THE SUPERS 1st 100 copies have arrived! UPDATE: 9/27/17 Edmonton Fan Expo was a blast! Had a great panel (soon to be available on the Trilogy Spoilers podcast for a listen! ), saw some old friends and made some new ones! Thanks to Happy Harbour Comics in Edmonton for a great After Party on the Saturday Night, and agreeing to host a Supers signing in the future (around Spring 2018)! Thanks to everyone involved with the Edmonton Fan Expo 2017 and I can't wait for 2018! And now onto Edmonton Fan Expo! Panel is Friday night 5:45pm to 6:45pm! Booth #4019 the entire weekend! UPDATE: 9/15/17 The Supers are on their way to Saskatoon Fan Expo! The Supers will be present at Centre for Arts and Technology booth #531 and we will be having our very first panel on Sunday 9/17 from 1-2pm in Room 1 with guests Elaine Will and Jeff Martin! Come on by! UPDATE: 8/31/17 The Supers #1 is headed to press! News on when the 1st Print will be available is coming soon! We project that Saskatoon Fan Expo 2017 will be the book's debut con! UPDATE: 8/16/17 Publishing news for "The Supers: 3rd Best Super-team in the World!" coming soon! We're looking to send everything to the printers on September 1st! VERY SOON! Premiere of The Supers Volume 1 is scheduled be at Saskatoon Fan Expo!!! Check back for updates! UPDATE: 8/6/17 Page 26 in COLOUR is up! Almost there! UPDATE: 8/4/17 It's been awhile, and that means lots of new artists on board and lots of news upcoming! Almost time to publish, once all this great art comes in! Stay tuned! UPDATE: 7/24/17 Page 26 is up, black and white and looking spectacular! Exciting news about publication dates coming soon! Check it out and the rest of The Supers #1 main story in the menu above! UPDATE: 7/5/17 Lots of things to talk about! New Blogs! The inked versions of "Epilogue: The Incident" are up! New dates in the calendar! New artists on board! Lots of exciting things happening as we get closer to publication! UPDATE: 6/19/17 Full Colour Page 25 is now up, check it out in the "Supers #1" tab above! UPDATE: 6/5/17 Full Colour Page 24 is up in the "Supers #1" tab...coming soon Full Colour Page 25! UPDATE: 5/13/17 Black and White Page 24 is up to check out! More exciting news about "Bonus Content" for The Supers coming soon! UPDATE: 4/21/17 New pages are up! Page 22 in colour and also Page 23 in colour too! Getting close to the end (of THIS story!) as the plan is for 27 pages! The light at the end of the tunnel is getting closer!!! UPDATE: 3/11/17 New pages are up! Page 21 is up and Page 22 in black and white! Check them out in the "The Supers #1" page!!! THE MAKING OF THE SUPERS #1 is ongoing. We are currently (as of 2/1/17) working on Page 21! We are getting close to the end of this 1st part of this journey! The biggest decisions have yet to come (whether or not to offer the comic online AND in print; how to get it printed and where; how to get it in the right hands; how many pages is enough? 22? 26? 32? 84????) but with the finish line within reach, I'm getting more and more excited about the possibility of this actually becoming a reality! Stay tuned! Here you will find one man's journey to create the comic book of his dreams. Through the trials and tribulations that make up the terrifying and vicious landscape of the comic book publishing world, our hero (me) Christopher Morris will destroy the gate keeper, crush the three-eyed monster, and answer the riddles three before finally saving the princess from the tallest tower and . . . I've lost my train of thought . 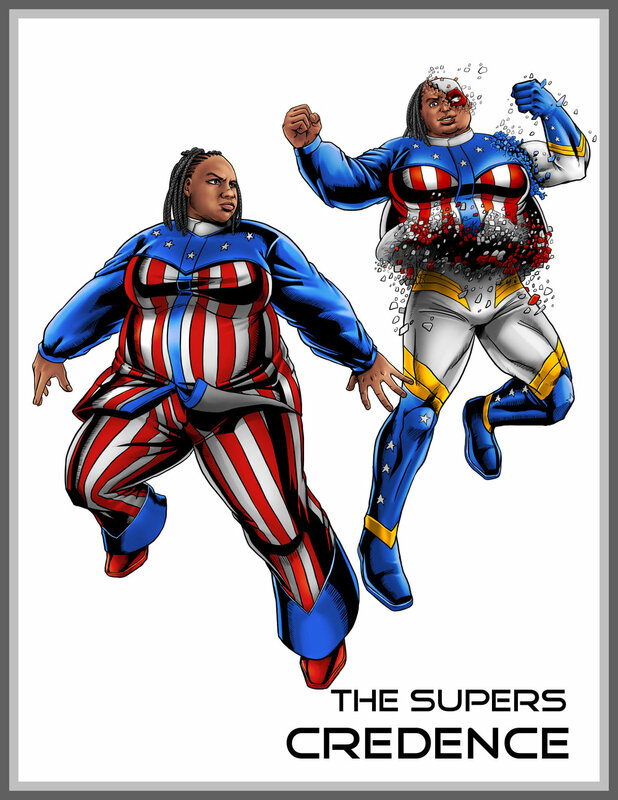 . .
What you'll find here are links to my blog, art work, comic book samples, and character profiles of my yet-to-be published comic book - THE SUPERS: The 3rd Best Super-Team in the World! - as I endeavour to find a publishing home for it and rise to comic book fame and fortune! Stand aside, world, here I come!